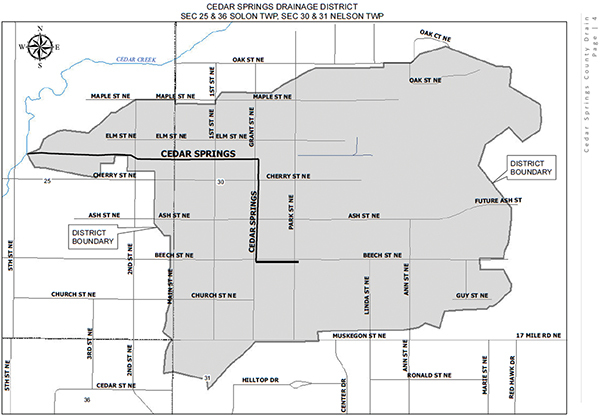 The Kent County Drain Commissioner recently sent out a notice about a meeting determining the future of the Cedar Springs County Drain, which will affect quite a few residents on the east side of Cedar Springs, and a few on the west side as well. The Board of Determination will meet at 7 p.m. on June 21, at Cedar Springs High School to decide whether a petition to clean out, relocate, widen, deepen, straighten, tile, extend or relocate along a highway is necessary to the public health. 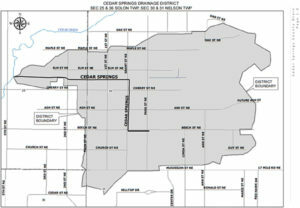 It will affect both the City of Cedar Springs and some of Nelson Township. According to Kent County Drain Commissioner Ken Yonker, due to recent permit requests, it was discovered that the Cedar Springs Drain runs under several existing buildings. Those properties cannot be further developed due to the County’s easement on the drain area. For instance, there is a restaurant that wants to buy the Gun Tavern and expand it, but cannot due to the drain running underneath. It also runs underneath the city property at the corner of Elm and Second Street, next to the old library, where the new fire station is to be built. It also puts development at a stand still. “In the city you have land that now can’t be developed because it’s sitting over the drain. It’s a bad scenario. It needs to be developed for the growth of Cedar Springs,” he said. They don’t yet have a definite plan to on what they would do, or where it would be moved if the board decided it was needed. But one thing is sure: both the city and the people in the drainage district will pay a portion of the cost. “I know it’s not an easy thing for Cedar Springs because it’s not a lot of people for the cost,” said Yonkers. He added that it would be a bonded cost and they would put it out as far as possible to keep the cost as low as possible for residents. Yonkers told the Post that if the Board votes to go ahead with the project, work would likely not start until late 2019 or early 2020. For more information, attend the meeting on June 21 or contact the Drain Commissioner at (616) 632-7910, or email drinfo@kentcountymi.gov.